Taste test: These chips had the same basic shape, texture and color as Doritos Nacho Cheese. The taste was generally pretty good, but some of the chips seemed to be more brittle than Doritos, resulting in a less appealing texture and less crunch. Also, the cheese powder didn't adhere to the chips as well as Doritos generally do, so some of the chips had a lot more cheese taste than others. 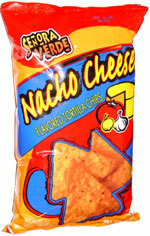 Still, for a bargain-priced chip, these were still an acceptable substitute for the full-price Doritos. Smell test: Good, very cheesy, very salty tortilla chips smell. Company: Save-a-Lot Food Stores Inc.